What we understand as 'gravity' is part of the same internal structuring of energies which causes a drop of water or a planet - a blob of energic ‘substance’ - to take on a spherical form. Internal radiating resonance creates its own event horizon that binds substance to shape - the surface(s) of a sphere are standing waves producing static yet fluid sheaths, bonding all levels of fields around its centre. Centre and surface are simultaneously boundary nodes which make the standing wave of the entire spherical structure possible. The surfaces of the Earth sphere extend beyond its physical limits - the planetary crust, atmosphere, ionosphere etc - and the latticework of timespace is interpenetrated by parallel and interleaving lattices as it depends through these zones, all vibrating at differing rates of energy density. The internal resonances of the Earth (or any sphere) extend far into potential - to the extremities of the infinite lattice itself - and the gravitic field extends around the sphere in a binding sheath whose influence extends literally everywhere. To remain stable a 3D solid must be internally symmetrical – it must be either spherical or composed of a minimum of four (interlaced) planes of equilateral triangles, i.e. a tetrahedron. The tetrahedron is not internally radially symmetrical. In the basal lattice which underlies 3-space, every tetrahedron is perpetually bonded with another, inverted tetrahedron, to form a paired (or regular) tetrahedron of 6 sides and vertices (vortices). This is the simplest structure that can exist with three balanced axes at right angles to each other. What may be viewed as particles or strings are actually vortexes - these can appear as bound strings, loops or points depending on grain of resolution (See Illustrations 2 & 5). The vibrating, resonating tetrahedral lattice of particles - spins of nothing in the quantum foam, or ‘vorticles’ - create ‘something’ in the charge created by the skein of their spin through time. The passage from a circle's centre to its circumference in timespace generates a phi spiral; a vortex is the geometric inverse of a sphere. These spinning vortices are created and linked together to form ‘subatomic particles’ by fields intersecting in phase. The 3-space lattice is overlaid with other matrices, wrapping to, around and through other fields of all possible energy densities in continual vortexial motion – the quantum reality of hyperspace. These fields focus around matter's motion in this or any other continuum - from a 3-space perspective. These 'vorticles' - spins we know as particles - oscillate at the vertices of the virtual tetrahedral structure of the basal 3-D matrix. This tessellation matrix is a virtual construct of lines of force, constantly vibrating; each component is oscillating along multiple vectors simultaneously. 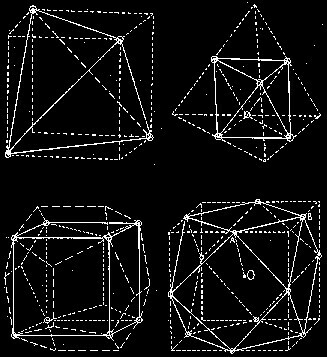 The vibration of a tetrahedron between two extreme nodes creates octahedrons and all other internally symmetrical structures - its vertices and harmonics provide their vectors as vorticles wink in and out of timespace See Illustration (1, 8 & 9). The multiverse (or hyperspace potential) comprises an infinite array of interpenetrating, resonating fields of all wavelengths and amplitudes. These are produced by fields extending from their centres right around the universe. Every possible object produces a universal field which is interpenetrating all other possible fields. Where these infinite fields of potential intersect at the correct angles to generate 3D structures, 3-space 'reality' is the result. Only those fields which intersect with each other at angles which give rise to stable 3D structures - and are in phase with one another - will manifest as the universe that we perceive. The intersection of these potential fields at right angles on all axes generates virtual octahedral and other 'Platonic' structures in TimeSpace. 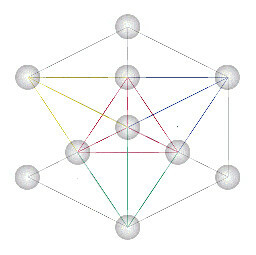 Parity (symmetry of vibration) causes the tetrahedral lattice to behave as a paired, or regular tetrahedral structure. All fields interpenetrate with adjacent potential positions in time and space, and all universes are subtly interlinked. There are always fields in phase with one another that manifest at opposing 180 degrees angles. The interpenetration of these fields creates the 'first dimension' of vertical height. This pole rotates as opposing fields wrap around each other while interpenetrating, generating centrifugal and centripetal forces (the second, horizontal 'width' dimension) - an equatorial polarity. A rotating structure precesses. This tertiary rotation creates the vectors for the third dimension via precessional motion; this rotation’s alignment through two circles around the vertical poles creates 'depth'. The tetrahedral field is always penetrated by other fields at harmonically constructive angles. 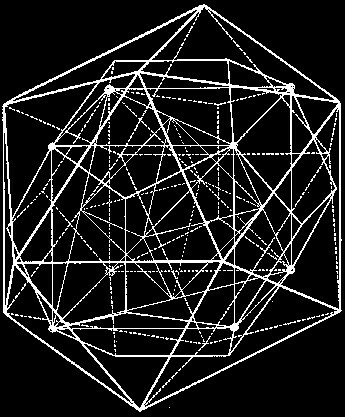 Two fields oscillating and overlapped at 45 degrees create the vectors for vorticles to manifest in the shapes of octahedrons, cubes, etc. 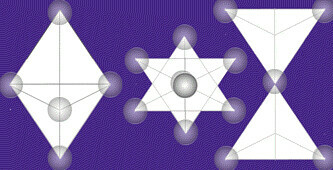 At the phase of interface where two opposing 60 degree fields interlace at the 4th harmonic they form a tetrahedral star of 8 'vorticles' - the 3D Seal of Solomon (see Illustrations 1 & 2). 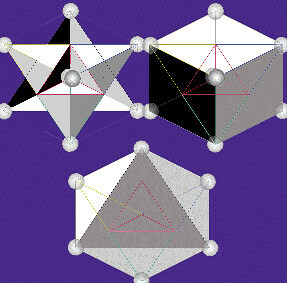 When the vertices of these 2 tetrahedrons are joined in potential, they form a virtual cube or octahedron, both rotated at 45 degrees with respect to the original solid. These structures are all in simultaneous existence, brought about by the shift in vibration of vorticles along virtual lines of force created by in-phase interpenetrating spinning fields. The octahedron vibrates in phase with its geometric negative or inverse - a cube. Each form is a further node of vibration, between which a standing wave of ‘material substance’ exists and travels. The standing wave which exists between these two nodes of vibration is a cube-octa - a cube intersecting an octahedron, skewed 45 degrees in relation to each other. This is a cluster of 14 meshed 'vorticles' (six plus eight) whose structure preserves parity (symmetry) of charge, unlike a simple cube or octahedron. This cube-octa of vorticles is the template for what 20th century science called the ‘neutron’ (see Illustration 10 & the work of T. B. Pawlicki). 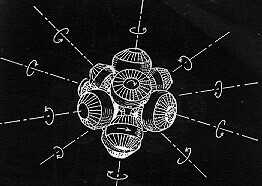 The cube-octa’s structure can collapse when 'struck' by vibration, transforming into a unit whereby 12 spinning vortices rotate around a central one, while the 14th becomes an ‘orbiting electron’. This dodecahedron (12-sided)-shaped cluster is the ‘proton’ of a hydrogen atom. The vorticles orbit within the facets of the dodecahedron, hence preserving orbital electron frequency. As the dodecahedron has opposing polar faces of identical spin direction moving around the two internalised and externalised vortices, it is charged, unlike the perfectly integrated ‘neutron’. Thus the 'proton' will be attracted to other forms emerging from the infinite intersecting rotating fields (and subsidiary orbiting vortices) until helium is ‘created’ and parity (symmetry) is reestablished (A neutron can collapse into a proton when struck - it takes 13.6 'electron volts' to 'kick' the 14th 'electron' out of the hydrogen atom). The neutron and the proton are the same fourteen vorticles rearranging themselves into complementary positions at the nodes of a standing wave, oscillating back and forth to accommodate the immortal structures of 3-space to the continually changing field of time. Due to the existence of phased vibrations, the universal field acts as an infinitely compressible fluid crystal. Different compression (energy density) and rotational states generate 'denser' elements (See Time Shift). The strongest local field permeating everything within our immediate experience - and against which other fields are easily referenced - is the field of the Sun. A 'spectrum' implies that electricity and magnetism will be found somewhere on the same frequency scale. This is simply not the case – magnetism is usually conceived as existing at right angles to electricity (though other Ponting vector relationships exist). Magnetism can be visualised as the conduit of electricity. When you construct an electric motor of spiralling coils around a central core, the intrinsic morphology of this structure creates remnant magnetic and electric fields. An electric motor is amplifying these fields, not generating them (see also the work of Edward Leedskalnin). Another way of visualising the fields - or dimensions – of magnetism and electricity is to note their affinity and relation with cold and heat respectively. Time, gravity, magnetism, and the other 'forces' of physics are not forces at all, but are actually extra dimensions - or fields - interacting with the three 'physical' dimensions we are customarily programmed to recognise. At the moment an image which 'will' be viewed or heard in the 'future' is recorded, the consciousness of that future audience impinges upon that moment, directly interfacing/interlacing with the minds of those present. The more viewers of a work, the more conscious perspectives intersect at the moment of its inception. If a recording or creative work is to be successful in its transmission - ie experienced by a wide audience during or subsequent to its creation - then 'the muse' will be with the artist and the work will appear to produce itself, or by an act of inspiration. The consciousness of the audience - and creator - is the muse. The artist is an instrument of the audience. Time is no barrier, but a medium. The Egyptian Pharaohs refused to have their countenances (or those of their families) accurately portrayed - with the exception of one notable heretic whose name and visage we almost erased from history before being recovered. Islam and other belief systems avoid portraying the human form. Each time we 'remember' the past a part of us is present there. We affect that moment and have 'already' done so. A memory - or imprint - to which we repeatedly return has 'fixed' itself in our awareness. It is overlaid with the multiple impressions communing with that moment throughout the 'future'. The focus of these ‘future (often more evolved, aware, wiser) selves' alters the original moment of imprinting radically, cross-linking it to other temporal planes. We are all self-referencing in time.